Authorized Car Service Center Market size is estimated to surpass USD 247 billion by 2024; according to a new research report by Global Market Insights, Inc. 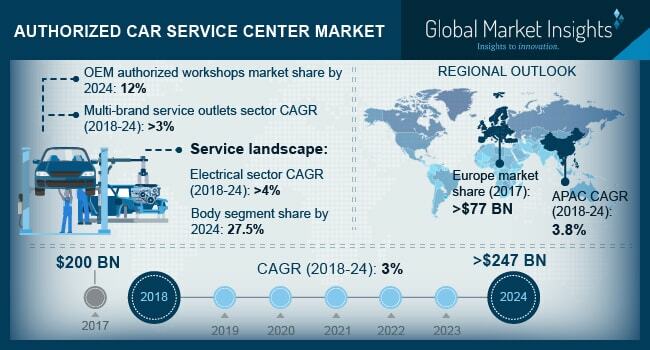 Presence of multiple passenger car service centers focusing on customer service, efficiency, and productivity is likely to boost the authorized car service center market demand. Affordable annual maintenance plans along with extended warranties will further enhance the industry size over the forecast timeframe. Numerous multi-brand service centers are commencing in tier 2 & 3 cities, favoring the authorized car service center business growth. Enhancing customer trust level accompanied with improved service support from licensed automobile workshops will boost the authorized car service center market size till 2024. The presence of innovative tools & machinery along with skilled technical experts will further escalate the service adoption. Rapid urbanization along with rising disposable income in emerging economies, particularly in Asia Pacific, will stimulate the business revenue. Organized multi-brand car service center segment is likely to show a significant growth rate of over 2.5% from 2018 to 2024. This growth can be credited to low labor cost as compared to OEM service centers. Transparent pricing estimates, quality spare parts, warranties, occasional offers, and discounts will further boost this service penetration. The lack of transparency associated with service charges and higher spare part replacement costs are the major challenges faced by the service providers. Old car owners usually do not prefer to adopt authorized service centers for their car servicing owing to high labor costs. Moreover, few authorized car service centers have bad reputation owing to their higher maintenance costs, negatively affecting the authorized car service center market size. However, industry participants are working on introducing annual maintenance plans that will provide customers with improved security against prohibitive costs. In terms of service, body segment from authorized car service center industry is expected to account for approximately 27.5% of the revenue share by 2024. The rising traffic in urban areas leads to substantial risk of small dents and scratches, resulting in minor refurbs for reinstating the vehicle to the original condition offering growth potential to the authorized car service center market share. Customized body parts and paints modification options, such as black roofs, vinyl stickers, and others, will also play a key role in the segment growth. The passenger cars with vehicle age of over three years will pose a CAGR of more than 3% over the forecast time span. Wear & tear of parts due to the vehicle age and frequent maintenance requirements are driving the authorized car service center market growth. Government regulations regarding the pollution levels from old vehicles will make the owners of such vehicles to modify parts and service their vehicles at regular intervals, contributing toward the industry’s revenue share. Asia Pacific authorized car service center market will exhibit 3.8% CAGR during the study period. Road infrastructure development in countries, such as India, China, and others, and increasing accidents due to the more number of vehicles running on-road will pave growth opportunities for the industry across the region. The increasing demand for vehicles and the emphasis on personal mobility will play a vital role in improving the industry size. 3M, Bosch, Carnation Auto, Carz Care, Castrol, Mahindra First Choice Services, Mobil1, and MyTVS are among the prominent multi-brand participants in authorized car service center market. Partnerships and joint ventures are among the well-known strategies adopted by the competitors to enhance their industry share. For instance, in June 2016, in India, Nissan entered into a strategic partnership with MyTVS to open Nissan Authorized Service Points (NASP) to provide convenient service options for Datsun and Nissan customers.